The repowering process involves replacing old coal boilers with gas-fired turbines that send heat to a heat-recovery steam generator (HRSG), which feeds a steam turbine. These types of systems can increase electricity production and overall efficiency of the plant by as much as 40% more than coal-fired plants. They help plant owners reduce costs—specifically maintenance costs—as newer, modern systems are easier to work with, Crowley said. The switch to natural gas results in other savings because feed stocks are abundant, less expensive, and easy to transport to plant sites. For decades, plants in areas such as California and Nevada have been at the forefront of the environmental movement. Many have already made the switch to natural gas. Crowley points to a global modernization effort that is following California’s lead—as plants in other parts of the United States, Mexico, China, India, and elsewhere around the globe, are standardizing on natural gas. Like all power plants, gas-fired plants require a lot of water. This boiler feed-water must be treated to avoid scale, corrosion, and other problems that damage or impede the boiler’s performance. There is a direct correlation between the quality of the water used and the efficiency of the plant. Depending on the feed-water quality, varying levels of pretreatment are necessary to remove impurities and suspended solids, and to adjust the water’s pH to a neutral level. Most businesses in the United States have a need to treat the water they use—whether they are food growers, juice makers, product manufacturers, or businesses such as hotels and restaurants. Some of the processes used include reverse osmosis (RO), pH adjustment, and scale inhibitors. Reverse osmosis. RO treatment processes work by using a semipermeable membrane to remove ions, molecules, and particles from water. Pressure forces water through the membrane, but larger molecules can’t pass through. RO demineralizes the water. In many areas of the country, there is a growing demand for RO applications and the associated treatment and maintenance applications that come with maintaining RO systems. RO membrane fibers are cellulose based. They degrade in alkaline conditions, which results in a loss of efficiency. Long-term exposure to alkaline conditions leads to membrane replacement, which is extremely expensive. Extending the life of the membrane fibers is accomplished in two primary ways—through pH adjustment and by administering scale inhibitors—both of which are dosed using metering pumps. pH adjustment. Raw, pre-treated water tends to be slightly alkaline. To protect the membrane, the pH of alkaline raw water is adjusted to neutral, by injecting precise amounts of acids (typically hydrochloric acid), to lower the pH. Once the treated (or permeated) water passes through the membrane, it can become slightly acidic. To deliver the best water quality possible, the pH is often re-adjusted using caustics (typically sodium bicarbonate) to achieve a neutral pH. Metering pumps are primarily used to inject the precise amounts of caustics needed for the process. The specifics of pH balancing are not as stringent as what a municipal drinking-water plant would administer, however the timing of the treatment is uncompromising. Power plants run 24/7 operations and cannot function without abundant supplies of treated water. As such, the pumps used must be highly reliable and able to run continuously. Following the initial treatment, process water flows to a flocculation basin where chemicals are dosed using metering pumps to aggregate precipitated particles, making them easier to filter out. After this treatment, the coagulated particles settle in a basin where they separate from water and are sent to a sludge-treatment facility. Scale inhibitors. Other water-treatment applications include administering scale inhibitors for cooling towers. Although water is ideally suited for cooling purposes, its life-giving properties can encourage bacterial growth that can foul system surfaces. Water also dissolves gases (oxygen and carbon dioxide), which can corrode metals. If untreated, scale deposits and fouling can reduce heat transfer and diminish the plant’s efficiency. To protect plant equipment, precise doses of sulfuric acid or phosphate are added to the cooling-tower water to mitigate scaling and to prevent fouling. 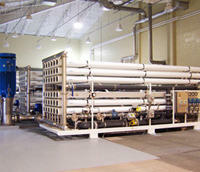 One by-product of the RO process is that suspended solids, microorganisms, and mineral scales accumulate on membranes. To extend the life of the RO membranes, and to increase the efficiency of the treatment process, a wide variety of scale inhibitors is dosed by metering pumps on the membranes. This saves money on chemical costs and helps prevent calcium-carbonate scaling. Metering pumps play a key role in maintaining the equipment. Bluefield Research (Boston) has forecast seven trends to watch in 2017, and they show significant opportunities for private corporations. These include an emphasis on big data and the Internet of Things, as well as new business models driven by rising water and wastewater bills. Water rates are rising at an average 7% every year, Bluefield stated. • Infrastructure investment at the forefront. • Rate escalation sets the stage for business-model innovation. • Developed markets forced to confront aging networks. • Water gets smart with an emphasis on Big Data and IoT. • Bottom line enables innovation for industrials. • California sets the stage for water reuse. • Private sector looks to water for opportunity. Additional analysis from the firm’s experts about each signpost is available at no cost. The forecast provides valuable insight for environmental managers and water companies about what to expect and market opportunities. Michelle Segrest is president of Navigate Content Inc. She specializes in creating content for the industrial processing industries. Please contact her at michelle@navigatecontent.com.